HENDERSON, NV, USA, March 21, 2019 /EINPresswire.com/ — K2 Energy has announced the appointment of Eric Villarreal as VP of Operations and Technical Sales. Mr. Villarreal has over 20 years of experience in product development, manufacturing and program management in various industries including lithium batteries, medical devices, and aerospace applications. He was an early employee at K2 Energy and founded the Battery Pack Development and Manufacturing side of the business while holding several positions from Program Manager to Director of Engineering. 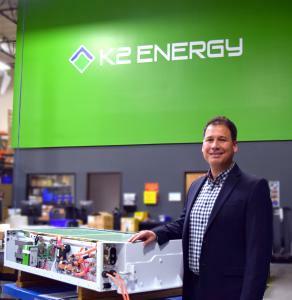 K2 Energy provides cutting edge technology for energy solutions. K2 Energy’s knowledge base allows them to offer inception to implementation solutions and to optimize battery solutions to achieve customer goals. K2 Energy at their core is a world class team of scientists and engineers with extensive knowledge and experience in all aspects of energy storage design, systems integration, manufacturing, support testing and quality control making them the ideal fit for many advanced medical, industrial, and military applications.